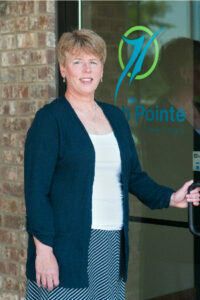 Physical Therapist ~ Ellen couldn’t stay away! She was part of the High Pointe family from 2009-2011 and returned in October 2015. Ellen is a graduate of The University of St. Augustine for Health Sciences and is a board certified pediatric specialist in physical therapy. Ellen also enjoys teaching occasionally in the physical therapy program at Belmont University and at Austin Peay State University. When she is not at High Pointe, Ellen hangs with her nieces and nephew, and volunteers with Music City Trykes (a fun organization that helps provide adapted bikes for kids with different abilities) and Tender Paws (a group that provides pet therapy to people in the Clarksville area).